Men's Pirates Flintlock Pistol Necklace : LOVE2HAVE in the UK! This men's silver necklace is one of some solid sterling silver pieces we sell inspired by nautical themes. The pendant, in this case, comes in the form of an intricately detailed flintlock pistol. The flintlock pistol is well known for its use by pirates and features prominently in films such as "Pirates of the Caribbean". The detail is just outstanding and more than conveys the highly skilled artistry that went into creating it. 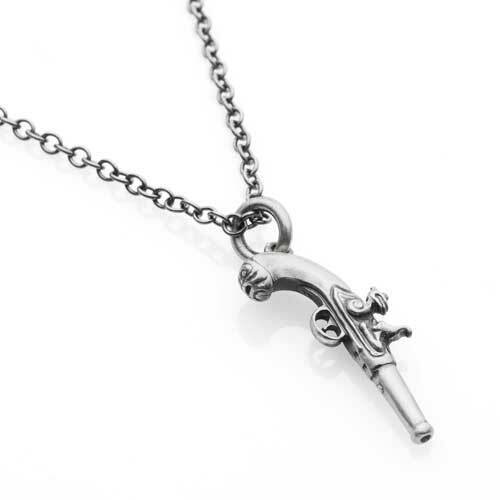 The flintlock comes on an 18-inch silver chain so is nice and secure, something that you will want to know if you intend to wear this on a beach holiday for example. It comes joined to the chain by an eyelet which is yet more attention to quality design and craftsmanship on behalf of the designer.